Wallace Earl De Pue was born October 1, 1932, in Columbus, Ohio, to Oscar and Lillian De Pue. By age seven, he was considered musically gifted. His cousin, Johnny Murphy, taught him to tap dance. Since Wallace possessed an extraordinary singing voice, he was featured in dance reviews and amateur shows as a boy soprano. In the fifth grade, he attended the Columbus Boy Choir School, now known as the American Boy Choir School. Concurrently, Eldon Howells and Frank Murphy taught him to become a concert pianist. In the 1950s, he won contests to appear on the Arthur Godfrey and Horace Heidt nation-wide talent shows. At Ohio State University High School, Wallace studied oil painting. He also learned about script writing and wrote a series of radio shows that were broadcast over local radio. In addition, he wrote his first operetta libretto and also composed music for his class graduation ceremony. Capital University accepted Wallace De Pue. He completed two bachelor degrees within five years, one in music education (BME) and another in music composition (BM). At Ohio State University, he completed a Master of Arts degree (MA). He earned a Ph.D. in music composition and theory at Michigan State University. Dr. H. Owen Reed was his major professor. High school choral music positions in Leetonia, and Dover, Ohio, respectively, provided Wallace De Pue with teaching experience. His next position was as Curator of Music at The Toledo Museum of Art (Toledo, Ohio). In 1965, Wallace De Pue married Linda Kallman, a fine pianist and music teacher. In 1966, he joined the faculty of Bowling Green State University in Bowling Green, Ohio. More than fifty of his works (for nearly all media) have been carried by other publishers, besides Picardie Court Publications. Three of his operas have been produced: Dr. Jekyll and Mr. Hyde, (recorded on cassette by Oceans Records, Los Gatos, CA. ), Something Special (televised several times and seen on Youtube.com), and The True Story of the Three Little Pigs (performed numerous times). The Wonderful Witch of Oz, his new opera, is aimed at pre-school children and is written on the subject of ecology. Dr. De Pue has won consecutive ASCAP awards for more than 26 years. Awards are given for the creation and performance of a composer’s music. Dr. De Pue’s works have won awards at both the state national, international, and world-wide levels. In 2014, he won the “Gold Medal” award of the Boston Metro Opera. (625 works were submitted from six continents.) Productions of his opera, Something Special, will begin in January of 2015. Wallace and Linda De Pue had four sons. All were taught music by their parents. Dr. De Pue started each son's career as a violinist. All were blessed with extraordinary talent for playing and singing. Mrs. De Pue was killed in an auto accident in 1986, so Dr. De Pue raised the family until he married Elaine Markopoulos in 1990. Their sons are known as The De Pue Brothers when they concertize as an ensemble. Hear the De Pue Brothers Band on YouTube. Wallace, Jr., earned his DMA degree at the University of Texas at Austin; Alexander is a two-time international “fiddle” champion who has played with Steven Vai, the father of “Music Fusion,” and Kevin Costner (movie star); Jason is a member of the first violin section of the Philadelphia Orchestra; and Zachary is the concertmaster of the Indianapolis Symphony. 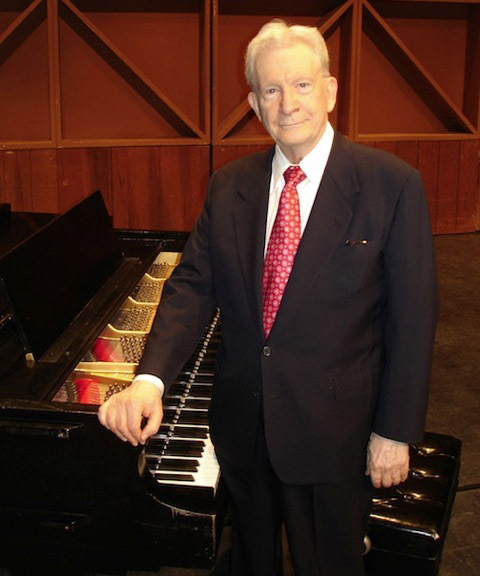 In 2006, Dr. De Pue's compositions were featured on The American Masters Concert Series, hosted by Maestro Paul Stanbery, and the Hamilton/Fairfield Symphony Orchestra and Chorale. On March 5, in Hamilton, Ohio, world premieres of Dr. De Pue’s Concerto for Percussion and Orchestra (duration: 21:00), and the orchestra’s commissioned work, The Bird, Frog and Tree Club (duration: 35:00), were performed with great success and a standing ovation. Composers honored in previous years were H. Owen Reed (La Fiesta Mexicana, a classic band work), Robert Ward (The Crucible, opera), Thomas Benjamin (The Alien Corn, opera), and James Niblock (Ruth, opera). On January 18, Maestro Stanbery, and the HMSO Board of Directors, entered Dr. De Pue’s commissioned work for consideration by the Pulitzer Prize In Music Committee of 2007. Since 1998, Wallace De Pue has been a Professor Emeritus from Bowling Green State University. Currently, he is directing his own ASCAP licensed publishing company, Picardie Court Publications. Compositions are for the following media: Choral works (all vocal combinations, a cappella and accompanied); orchestral and band works; pieces for two-to-four violins, some accompanied by piano; songs for all voice qualities (some with piano accompaniment); keyboard works (piano, organ, hammer dulcimer, and harpsichord); solo percussion works; instrumental solos and ensembles, and the aforementioned operas. Dr. De Pue authored Creative Music Theory Skills, a book concerning beginning music theory for potential composers. His textbook was used successfully at Bowling Green State University. My reason for founding a publishing house was to share my arrangements and original compositions with people all over the world. Although I used to publish my music through famous publishing houses, I found that doing so was impractical. They would either sell hundreds of copies on their first printing or place my work in their POP (permanently out of print) files. They would not allow me to reclaim them! Many of my compositions are unavailable to choral musicians because of such an unethical practice.